The second-generation Eco radiator thermostat from Danfoss has arrived. The new Eco provides effortless heating control using the Danfoss Eco App to program individual radiator thermostats via Bluetooth technology. Offering an easy and cost-effective transition to intelligent heating for homes and small commercial premises, Eco ensures optimum comfort and potential savings of up to 30% on heating bills. In addition to the energy saving benefits for end-users, Danfoss Eco is purpose-designed to be fast and simple to install by a professional heating installer in new and replacement applications. The intuitive Danfoss Eco App makes it easy for end-users to program the heating to suit their daily schedule and keep rooms comfortably warm when occupied, and cooler when empty. Having downloaded the App and activated Bluetooth, Eco thermostats can be programmed individually from a smartphone from a distance of up to 10 metres: a red light is illuminated on the thermostat to indicate successful connection. Alternatively, Eco can be adjusted manually using the turn-wheel option. 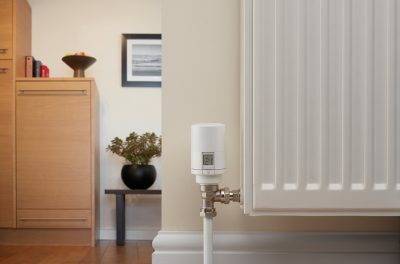 As a further benefit, the new Danfoss Eco radiator thermostat is compatible with 90% of all radiator valves. This makes it an ideal solution for upgrading existing installations, either as a replacement on all radiators for maximum energy savings, or starting with just the one. And on top of all its innovative features, Danfoss Eco also boasts best-in-class noise performance at less than 30dBA.